Product prices and availability are accurate as of 2019-04-20 20:17:34 UTC and are subject to change. Any price and availability information displayed on http://www.amazon.com/ at the time of purchase will apply to the purchase of this product. Get the best of both worlds with Seville Classics Tower Fan Combo. The stylish Seville Classics UltraSlimline 40 in. 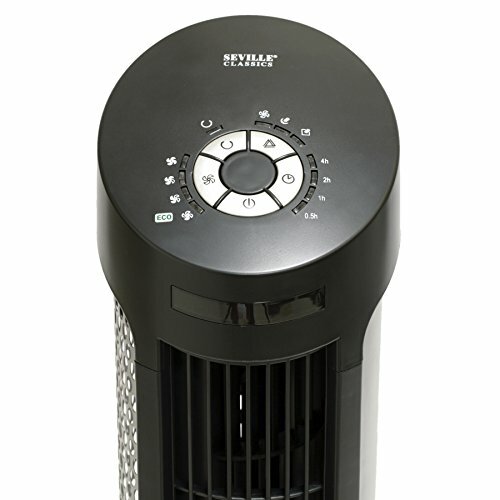 Oscillating Tower Fan is perfect for the office, bedroom or any room that needs a breeze. It is equipped with four ultra-quiet speed settings (high, medium, low and "eco") that will leave you feeling cool and comfortable on hot and humid days. Oscillating feature provides 75 degrees of coverage. Regulate the fan with the included LCD remote and timer feature. This device offers a sophisticated slim profile in a satin black finish with an attractive silver steel intake grill. The compact UltraSlimline has a footprint of less than 1 sq. ft. to occupy minimal floor space. Always bring the cool breeze with you by using the UltraSlimline 17 in. Oscillating Personal Tower Fan. Designed to be lightweight and compact, this personal fan can easily fit into any workstation such as an office, desk, dorm, cubicle, kitchen or garage. With three speed settings, optional timing selections (1, 2 or 4 hours) and oscillation, you can personalize the device to produce that perfect breeze. Note: UltraSlimline fans should be cleaned often when they are used frequently and over long periods to help extend the life and operability. The best ways to do this include wiping down the outside panels with a dry cloth, using compressed-air cans and using hand vacuums to remove the buildup of dust particles. They are not designed to be taken apart; review the manual for further information. 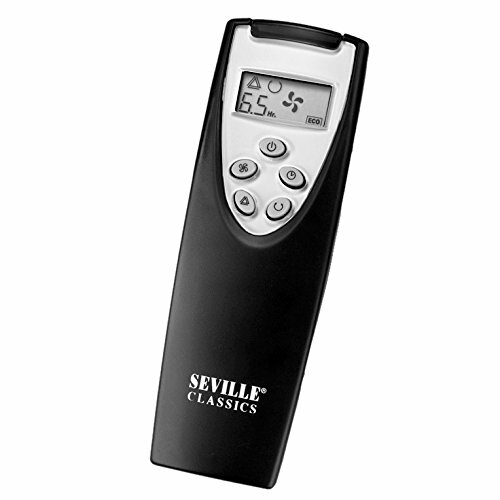 • Four ultra-quiet speed settings: High, Medium, Low, "Eco"
• Includes LCD remote control (2 AAA batteries included) with 15 ft. of range fully-charged. • Space saving compact UltraSlimline designs each have footprints of less than 1 sq. ft.
Includes one UltraSlimline 40 in. 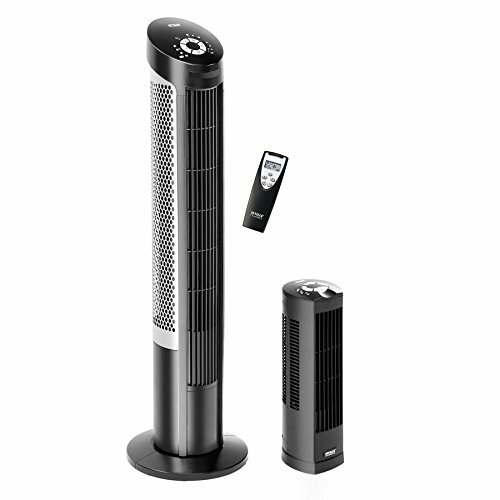 Oscillating Tower Fan and one UltraSlimline 17 in. 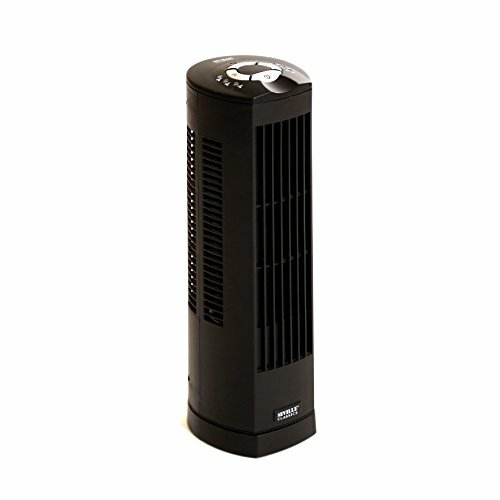 Oscillating Personal Tower Fan Multiple fan speeds from low- to high-power Quiet operation from internally mounted fans;6.25 feet power cord Oscillating feature works to cool entire rooms, or just your personal space, efficiently Black finish allows fans to blend in to the décor of any room.